I read this article and found it very interesting, thought it might be something for you. 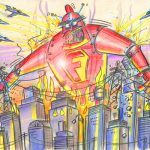 The article is called Economist Branko Milanović: Three Fallacies That Make You Fear a Robot Economy and is located at http://evonomics.com/three-fallacies-robot-economy-branko/. 1. The first is the fallacy of the lump of labor doctrine that holds that the new machines will displace huge numbers of workers and people will remain jobless forever. Yes, the shorter our time-horizon, the more that proposition seems reasonable. Because in the short term the number of jobs is limited and if more jobs are done by machines fewer jobs will be left for people. But as soon as we extend our gaze toward longer-time horizons, the number of job becomes variable. We cannot pinpoint what they would be (because we do not know what new technologies will bring) but this is where the experience of two centuries of technological progress becomes useful. We know that similar fears have always existed and were never justified. New technologies ended up creating enough new jobs, and actually more and better jobs than were lost. This does not mean that there would no losers. There will be workers replaced by the new machines (called “robots”) or people whose wages will be reduced. But however these losses may be sad and tragic for individuals involved they do not change the entire society. 2. The second “lump” fallacy which is linked with the first, namely our inability to pinpoint what new technology will bring, is that human needs are limited. The two are related in the following way: we imagine (again, looking only at any given moment in time) that human needs are limited to what we know exists today, what people aspire to today, and cannot see what new needs will arise with a new technology. Consequently we cannot imagine what will be the new jobs to satisfy the newly created needs. Again history comes to the rescue. Only ten years ago we could not imagine the need for an intelligent cell phone (because we could not imagine it could exist) and thus we could not imagine the new jobs created by the iPhone (from Uber to ticket sales). Only 40 years ago, we could not imagine the need to have our own computer in every room and we could not imagine millions of new jobs created by the PC. Some 100+ years ago we could not imagine the need for a personal motor car and thus we could not imagine Detroit and Ford and GM and Toyota and even things like Michelin restaurant guide. 3. The third “lump” fallacy (which is not directly related to the issue of robotics) is the lump of raw materials and energy fallacy, the so called “carriage capacity of the Earth”. There are of course geological limits to raw materials simply because the Earth is a limited system. But our experience teaches us that these limits are much wider than we generally think at any point in time because our knowledge of what earth contains is itself limited by our level of technology. The better our technology, the more reserves of everything we discover. Yet accepting that X is an exhaustible energy source or a raw material and that at the current rate of utilization it will run out in Y years is only a part of the story. It neglects the fact that with the rising scarcity and price of X, there will be greater incentive to create substitutes (as inventions of sugar beet, synthetic rubber or fracking show) or to use a different combination of inputs to produce the final goods that now use X. Indeed, the cost of the final good may go up but here again we are talking about a change in some relative prices, not about the a cataclysmic event. Earth carriage capacity which does not include development of technology and pricing in its equation is just another “lump” fallacy. Some famous economists like Jevons who collected tons of paper in the expectation that the trees would run out entertained the same illogical fears. Not only did it turn out that, with many thousand (or milion?) times greater use of paper, the world did not run out of trees—Jevons simply, and understandably, could not imagine that technology would enable recycling of paper and that electronic communications would substitute for much of what paper was used for. We are not smarter than Jevons because we too cannot imagine what might replace fuel oil or magnesium or iron ore, but we should be able to understand the process whereby these substitutions come about and to reason by analogy. Fears of robotics and technology respond, I think, to two human frailties. One is cognitive: we do not know what the future technological change will be and thus cannot tell what our future needs will be. The second is psychological: our desire to get a thrill from the fear of the unknown, from that scary and yet alluring prospect of metallic robots replacing workers in factory halls. It responds to the same need that makes us go and watch scary movies. When we do not go to a movie theater we like to scare ourselves with the exhaustion of natural resources, limits to growth and replacement of people by robots. It may be a fun thing to do but history teaches us that it is not the one that we should rationally fear. Originally published at Global Inequality Blog.